MCHIP addresses the barriers to accessing and using key evidence-based interventions across the life stages—from pre-pregnancy to age 5—by linking communities, primary health facilities and hospitals. By helping countries identify and focus on those innovations that will save lives, MCHIP supports delivery of evidence-based interventions through strengthening government health systems, nongovernmental organizations and other local partners. MCHIP addressed the barriers to accessing and using key evidence-based interventions across the life stages—from pre-pregnancy to age 5—by linking communities, primary health facilities and hospitals. By helping countries identify and focus on those innovations that will save lives, MCHIP supported delivery of evidence-based interventions through strengthening government health systems, nongovernmental organizations and other local partners. 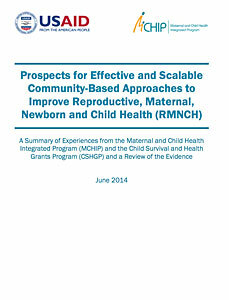 In June 2014, USAID announced MCHIP’s successor program, the Maternal and Child Survival Program. Visit this flagship program, working to end preventable child and maternal deaths, at www.mcsprogram.org. MCHIP activities contributed to global reductions in maternal and child deaths, and improved the health of women (from planning a family through pregnancy and delivery) and their children (from infancy through childhood). 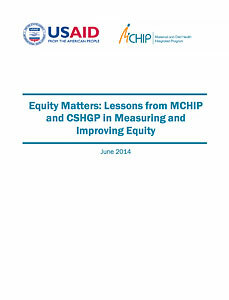 At the household, community and hospital levels, MCHIP implemented and worked to scale up high-impact interventions. – Across MCHIP countries, USG-supported training programs graduated nearly 308,000* participants. – Over the life of the project, 182 national policies were drafted with USG support. * Actual total for life of project is 307,759 total training participants. MCHIP supported programming in maternal, newborn and child health, immunization, family planning, malaria and HIV/AIDS, and strongly encouraged opportunities for integration. Cross-cutting technical areas included water, sanitation, hygiene, urban health, and health systems strengthening. MCHIP presented a vehicle in which the whole is greater than the sum of individual parts, enabling the Program to respond to the need for a more integrated approach to services while taking into account epidemiology, health system capacity, efficacy, coverage, cost, cultural acceptability and other factors. Although the strategies for implementation varied widely from country to country, dependent on contextual factors such as the strength of the health system, the relationship with the government, cultural factors, geography, etc., several key themes, were critical for success, regardless of region or intervention. These resources explore learning on four key themes – scale up, community level activities, quality of service provision, and equity – from the broad experiences of MCHIP, as well as the broader reproductive, maternal, newborn and child health community. Of the low- and middle-income countries that have achieved the greatest declines in under-five mortality since 1990, strong community-based programs that rely on community-level providers is a common feature. And existing and growing evidence speaks to the positive contributions that community health workers (CHWs) are making to these improved health outcomes. 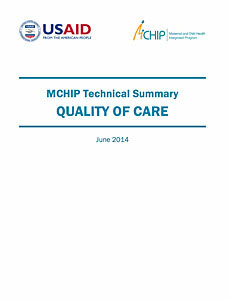 MCHIP understood that these facts—and the estimated worldwide shortage of 4.3 million health workers—meant that well-functioning CHW programs were key to improving the health of vulnerable populations. As a result, the Program worked to strengthen the capacity of health systems to engage communities and to build strong systems of service delivery outside of health facilities that have the ability to reach those that were not yet being reached by essential health services. Scale-up is a deliberate process involving explicit goals and thorough planning. Scale-up efforts occur after there is evidence that the intervention will be effective in that setting. The intent of scale-up is to benefit more people by expanding access and use of the intervention. The establishment of supportive policies and routine service delivery processes is essential in order to institutionalize the intervention and achieve lasting benefits. 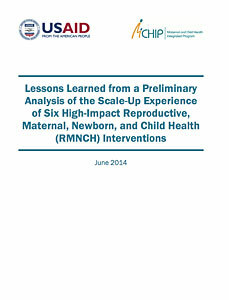 It also posits that scale-up is most likely to be successful where there is local ownership of the decision to scale up; strong collaboration by government officials, technical advisors, and donors around a common vision; and a systematic and integrated approach to make the intervention a sustainable part of the routine health system through institutionalization and expansion. Despite overall progress in global health in the past several decades, significant inequities persist. Key to achieving impact at scale is making sure that interventions reach those who need them most and there is equitable distribution of coverage across socioeconomic, ethnic, gender, and other population groups within countries. Equity must be intentionally pursued as a strategy; it will not necessarily happen as a byproduct of other development efforts. However, whether programs address or exacerbate inequities depends on how the programs are designed and implemented. MCHIP programs aimed to reach the hard-to-reach and marginalized groups to improve access, use and equity. Country programs worked to strengthen the voice of the community to demand more equitable service provision.